Bands and artists that played Hard Rock Live Orlando in 2012 include the following: Halestorm, Weezer, Counting Crows, The Script, Childish Gambino, Bon Iver, Chris Cornell, Slash, The Fray and Megadeth. The current concert calendar at Hard Rock Live Hollywood has the following bands and artists coming to its stage this year: The Postal Service on June 5; Juanes on June 28; Mac Miller on July 6; OneRepublic on August 12; The Killers on August 16; Victoria Justice on August 17 and Steely Dan on September 11. Tickets for all concerts at Hard Rock Live Orlando this summer can be found right here at SeatGeek. 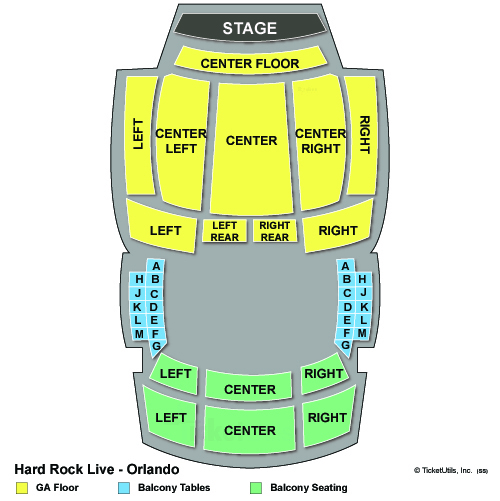 For a look at the seating chart for concerts at Hard Rock Live Orlando, check out the image below.